We all love pooh sticks and summer is great for getting out, finding a wide bridge and racing them. But sometimes it`s hard to tell who`s is who`s, so here is how to make yours stand out without being harsh to nature. Next time you take a trip with your parents to any park with lots of trees or woods, choose 3 or 4 decent sized sticks to bring home. Try and choose those of the same size and weight. Then find 3 or 4 different leaves. When you get them home, break an egg and take a little of the white of the egg. Save the rest in the fridge to use for breakfast or an omlette for lunch. Paste some of the egg white to each one, attach a leaf, and leave to dry. Or choose to carve and die patches on them using foods that have strong natural color or from ready made food coloring. You can use purple from blackberries growing wild, green color from grass or leaves, yellow from curry powder (but don`t get it up your nose), or use fruit tea bags. Take each stick and carve off some of the bark. You can make a pattern if you like to make it jazzy. Then take the die and rub it into the scraped surface. 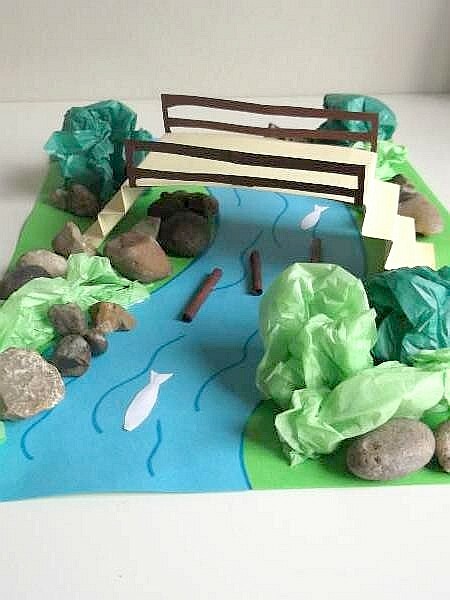 Now you can go find a bridge over a river and play pooh sticks. The wider the bridge the better! 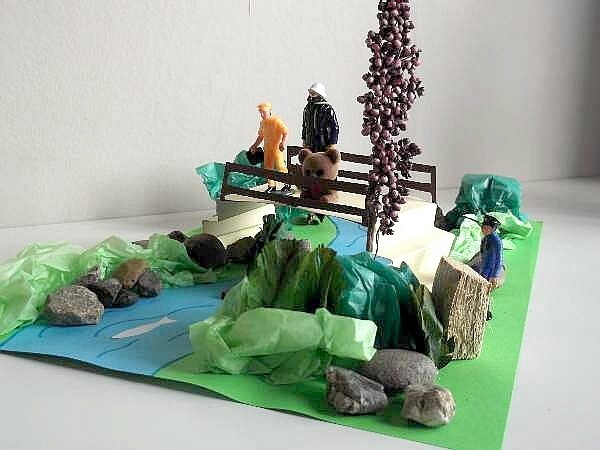 Why not make your own pooh sticks landscape model with paper. 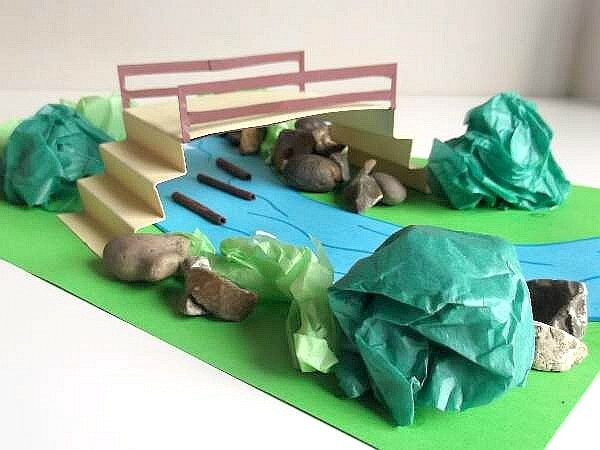 Here is how to make it with a river and a bridge to remember your day out. 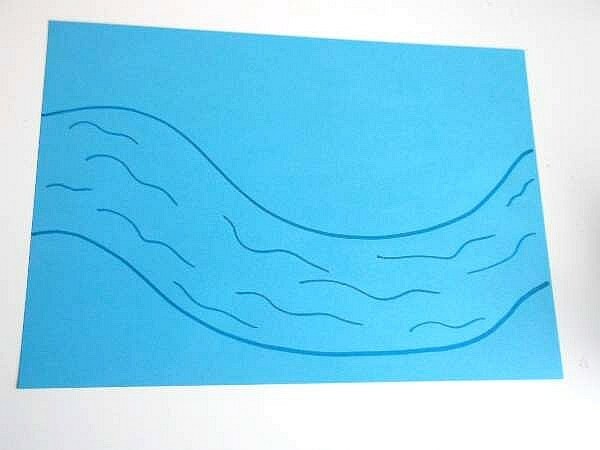 Draw a long winding river on your blue paper, cut it out and stick it onto the green sheet. 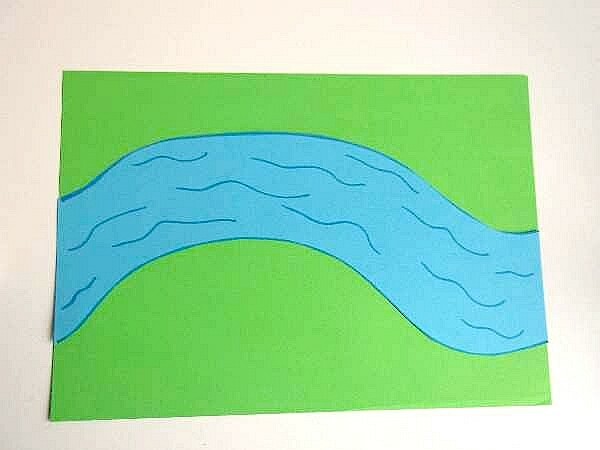 Alternatively, you can draw the river on a white sheet and paint it blue or greeny-blue if you like, then paint the surrounding green. 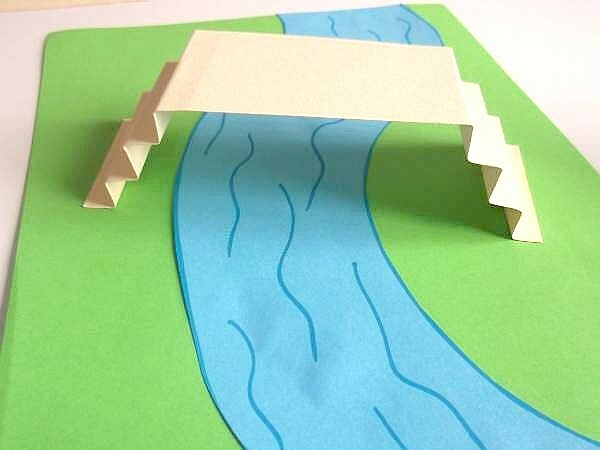 Draw some waves along the river to make it look like the water is flowing. 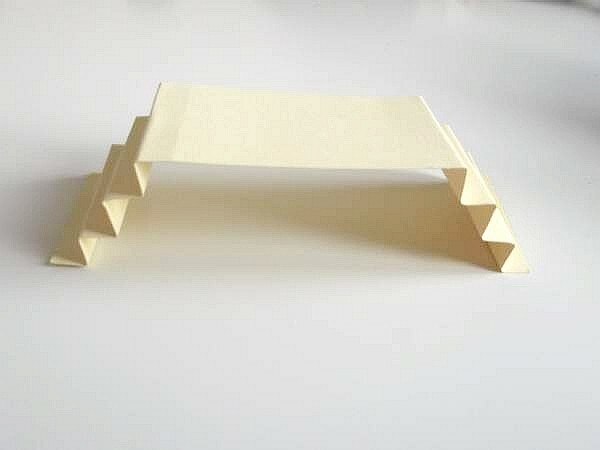 To make a bridge, cut a 2 x 8 1/2 inch oblong from the tan card and make 6 folds at each end to make the steps. 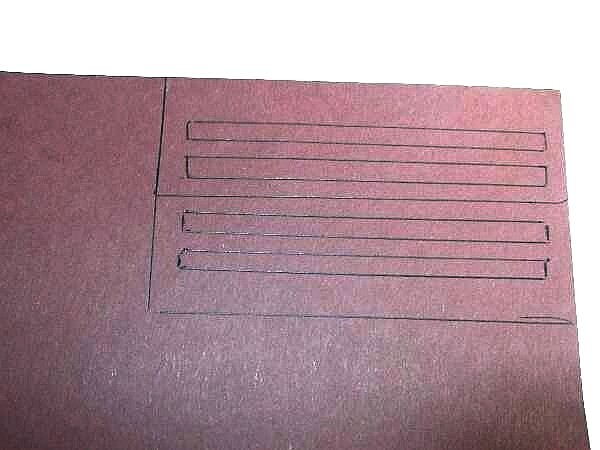 Stick the ends to each side of the river. 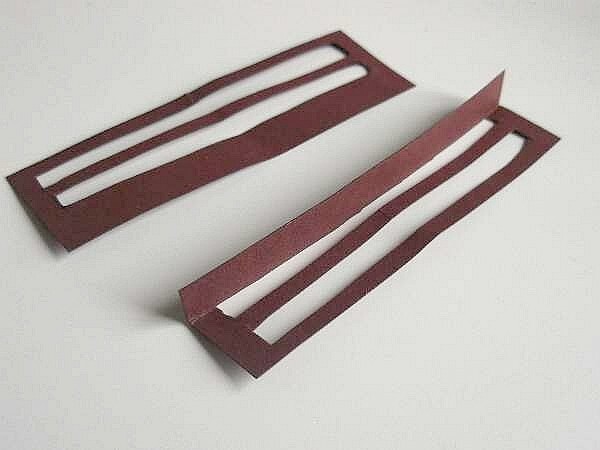 Draw and cut out 2 railings for your bridge using the brown or black card. 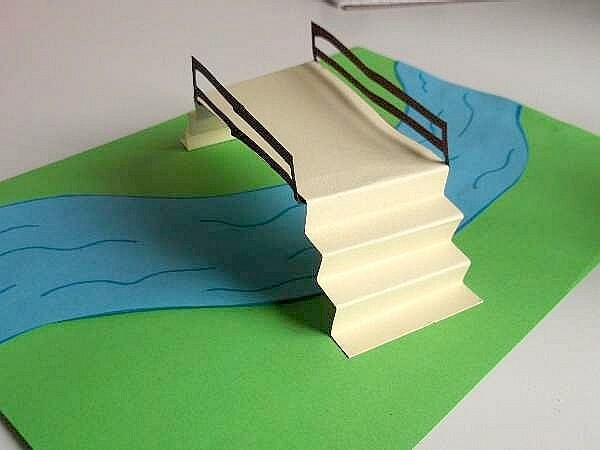 The width of the railings should be the width of your bridge excluding the steps. Make the railing 1 1/2 inches wide. 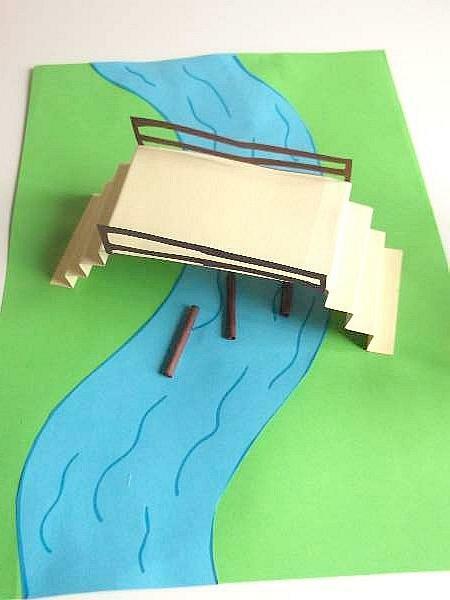 Fold the half inch under the bridge leaving a 1 inch railing and glue in place. 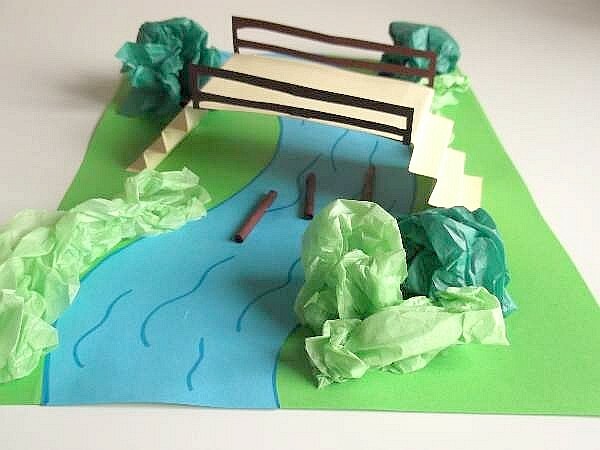 Now bunch up different sized squares of green tissue paper and glue them along the river bank to make trees. 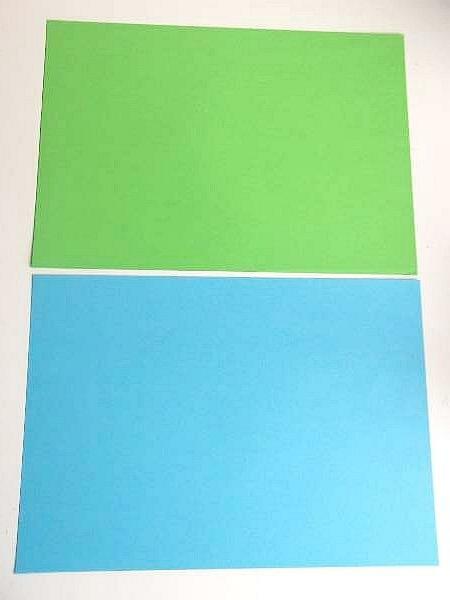 Two different shades of green tissue help to make them look more like trees. You can even stick on anything that is natural like pieces of pot pourri or little flowers if you want your landscape to look more interesting. 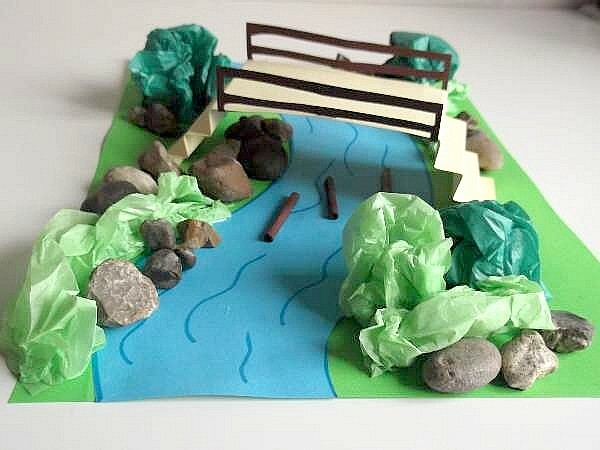 A handful of pebbles or small stones will make the scenery look very rocky and natural. We got these from the driveway. Lol! 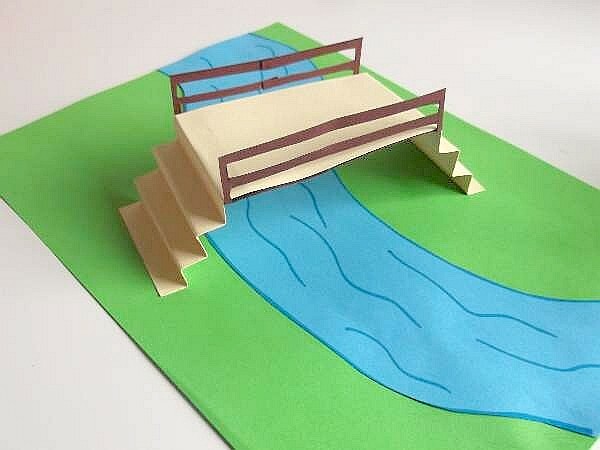 Place them around the foot of the bridge steps and some right on the edge and in the river. Add some thin silver fish. But make them all swim in the same direction of course with the pooh sticks and the water. You can make them from white paper or silver foil. 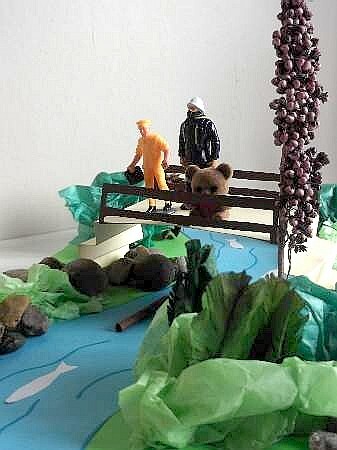 Now all that is left to do is find is a few friends to play pooh sticks with. See more summer craft projects to make and enjoy.